Mawlynnong - about 90 kilometres from the capital of Meghalaya, Shillong, the village has earned a unique distinction of being the cleanest village in Asia. 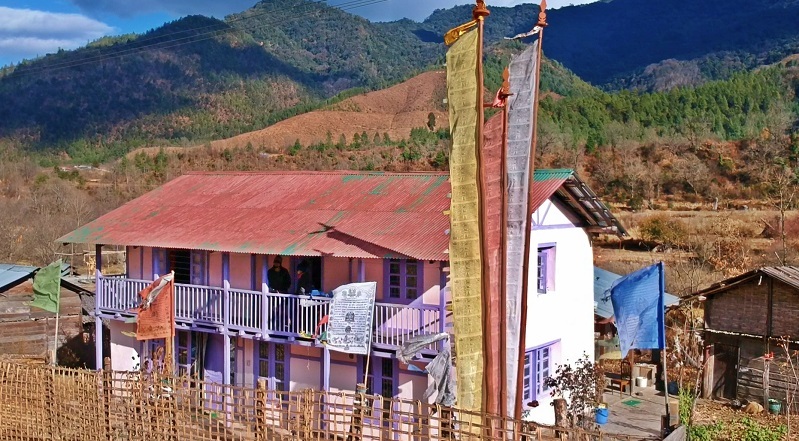 Nestled in the pristine hills of Meghalaya, Mawlynnong is home to about 90 houses. Discover India magazine declared the village as the cleanest in Asia in 2003. Mawlynnong is over hundred years old. Keeping the surrounding environment clean is an age old tradition. Local residents here grow different flowers around their houses to complement the beauty of their tiny cottages. A dustbin made out of bamboo is found all along the village. Every one makes it a point that dirt and waste are not thrown everywhere. All the waste from the dustbin is collected and kept in a pit, which the villagers use as manure. Mawlynnong is 90 kilometres from Shillong and barely 4km from the Bangladesh border. It is one of the wettest parts of the country. The society is matrilineal making women economically powerful. The Khasi tribal inhabitants are known to be worshippers of nature. The main occupation of the villagers is agriculture. They mostly grow betel nut. Apart from being Asia's cleanest village, Mawlynnong offers many interesting sights such as the living root bridge and another strange natural phenomenon of a boulder balancing on another small rock. Living to visit the place! The cleanest village in Asia - it looks so beautiful. nature at its best in these otherwise devastated landscape. please protect it. Great blog guys. Just returned from Meghalaya. Very beautiful place. It was monsoons and so the rain just fell and fell, as if isolating you in a dream world. Wow what I gonna say to this Beautiful village!! It has the most fresh air, nice condition, respectful and a cristal clear surronding I wanna go again to this place I had missed this village a lot!! I have been once during winter season, its really beautiful and so amazing place. HA HA, by just putting the dustbins throughout the village the author is describing the village the cleanest village in the Asia. Just ridiculous.. If it is right then The Great Khali is the most handsome person in the world!!!! Yeah, and I am the richest person of the world. yeah me too Ajit brother..